ルードヴィック・ケネディ『戦艦ビスマルクの最期（Pursuit: The Chase and Sinking of the "Bismarck"）』 ハヤカワ文庫NF、1982年、ISBN 4-15-050082-7. Bercuson, David J and Holger H. Herwig, The Destruction of the Bismarck (Woodstock and New York: The Overlook Press, 2001). ISBN 1-58567-192-4. Chesneau, Roger (2002). 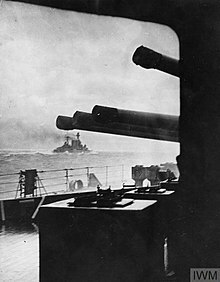 Hood -Life and Death of a Battlecruiser (London: Cassell Publishing). ISBN 0-304-35980-7. B.B. Schofield Loss of the Bismarck, Ian Allen Ltd. 1972. VE Tarrant, King George V Class Battleships, Arms and Armour Press, 1991. ISBN 1-85409-524-2. ^ Bercuson and Herwig, 140. ^ Boyne, Walter J., Clash of Titans: World War II at Sea (New York, Simon & Schuster, 1995), 59. ^ Chesneau 2002, p. 156. ^ History Channel Dogfights: Sink the Bismarck. ^ Bercuson and Herwig, 165-6. ^ Bercuson and Herwig, 166. ^ Bercuson and Herwig, 166-7. ^ Bercuson and Herwig, 169-70. ^ Bercuson and Herwig, 170. ^ Bercuson and Herwig, 171. ^ Bercuson and Herwig, 169. ^ Cited in Müllenheim-Rechberg, Battleship Bismarck, 149.